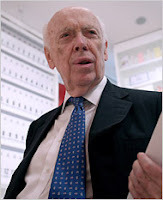 James Watson's grotesque gaffe last week provides an opportunity to revisit his inexcusable treatment of Rosalind Franklin in the early 1950's in the process of his taking credit, with Francis Crick, for the discovery of the helical structure of DNA. Fifty years and more have passed, but Watson's character has maintained its regrettably low level. A predictably perfect storm thereupon broke over poor Jim's head, his speaking engagements in England were canceled, he was suspended from his job as Chancellor of the Cold Spring Harbor Laboratory in New York and he fled home to the U.S. in disgrace. This brings me back to Watson's ruinous treatment of a wonderful woman and surpassingly brilliant scientist -- Rosalind Franklin. 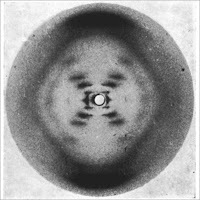 In the early 50's Watson and Francis Crick at Cambridge, Linus Pauling at Cal Tech and Rosalind Franklin and Maurice Wilkins at Kings College in London were all racing to discover the structure of DNA. Watson and Crick were biologists, but approached the problem primarily as molecular model builders. Franklin and Wilkins were x-ray crystallographers. Pauling was, of course, the greatest chemist of his day. 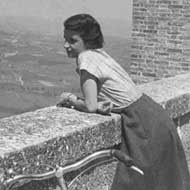 Although Rosalind was not herself, so it seems, convinced at the time she produced this photo that the structure was helical, her images nevertheless spoke for themselves. Wilkins was nominally her collaborator at Kings College, but was in fact subordinate to her, in rank and ability. Wilkins had meanwhile developed a friendly relationship with Watson and Crick, who were making progress with their clever model building, but their approach was top-down, so they had no experimental data to guide them through to a final understanding of the structure of DNA. "We have also been stimulated by a knowledge of the general nature of the unpublished experimental results and ideas of Dr. M.H.F. Wilkins, Dr. R.E. Franklin and their co-workers at King's College, London." This was in 1953. 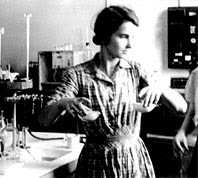 Rosalind Franklin died of ovarian cancer (thought by many to have resulted from her long hours of unprotected exposure to x-ray radiation in her laboratory -- cf., Marie Curie and Richard Feynman) in 1958. Watson and Crick, joined somewhat undeservedly by Wilkins, were awarded the Nobel Prize in Physiology or Medicine in 1962. "Momentarily I wondered how she would look if she took off her glasses and did something novel with her hair...Though her features were strong, she was not unattractive and might have been quite stunning had she taken even a mild interest in her clothes...There was never lipstick to contract with her straight black hair...."
Utter drivel, of course. No surprise that Harvard refused to publish the book (for this, among other good reasons). Any man with an eye for women can recognize here Watson's underlying attraction to Rosalind and his wounded vanity that she treated him as an unimportant toad. Was she so unattractive? I don't think so. The story has an ironic if not a happy end. Watson's reputation has spiralled (pardon the pun) steadily downward over the years, reaching its nadir last week with his pathetic white supremacist remarks in England. Rosy's repute and estimation in the eyes of the public in general and the scientific community in particular has on the other hand risen steadily. (It is a beautiful analogue of the DNA helix itself -- one coil spirals downward and the other spirals upward.) As a scientist, she is now recognized as one of the greatest contributors to one of the most important scientific achievements in the history of mankind. As a woman, she is recognized as one of the most remarkable in a long line of brilliant women (Marie Curie, Lise Meitner, Cecilia Payne and Jocelyn Bell, to name just four) who have achieved greatness in science notwithstanding the oppression, opposition and obstruction of the many swinish alpha males with whom they were surrounded. See, for example, the Nova website, The Secret of Photo 51 , the excellent biography by Brenda Maddox, Rosalind Franklin -- The Dark Lady of DNA, and the more recent article, "Rosalind Franklin and the Double Helix," by Lynn Elkin in Physics Today (Prof. Elkin, to my delight, chose the same two photos as did I to depict Rosalind). Coda: The book Watson was in England to promote is or was called, Avoid Boring People and Other Lessons from a Life in Science. I assume it will now be re-titled: Avoid Boorish People and Other Lessons the Author Never Learned. No surprise, at the leading scientific conferences in this field, you will find little mention of Raymond Damadian, in addition to Paul Lauterbur and Sir Peter Mansfield.